BC USA's adorable "Japanese Erasers" have been taking Harvard Square (and probably other places too) by storm. They make everything from cupcakes to toothpaste to samurai to hamsters, all in pocketable, collectible eraser form. Of course I always want to buy those--I'm a sucker for small cute things that I can line up and admire while my roommate rolls her eyes. 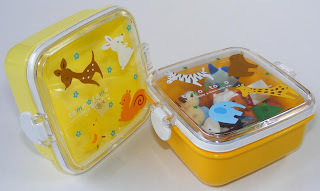 This week, though, I'm inspired to buy this little eraser box, which doubles as a tiny bento! It's just the right size (about 4" square, 2" deep) for a collection of eraser food or for a real snack or side dish to slip into my lunch box. It's got two clips on the sides of the lid for an airtight seal, and it's got sweet little woodland or zoo animals on it, to boot! It just doesn't get better than that! Trust the folks at Smithsonian to come up with something as great as this! All it takes is the base rocks and chemical powder provided, some boiling water, and the kit's blister packaging to grow awesome crystals in green, yellow or blue! The step by step instructions on the back of the package explain the process in detail, including little illustrations, so even the least instructions-capable person can figure them out. I also really like the fact that the plastic blister packaging that the kit comes in gets re-used as mixing and growing cups for the crystals--way to be green and cut down on waste, Smithsonian! I don't usually post about books, because it's a given that I want to buy those, and our other staff pick roundups and other posts often touch on the newest and coolest. 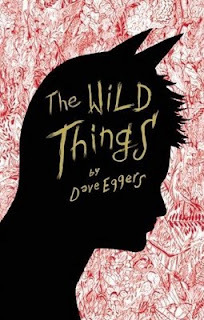 Still, since the Where the Wild Things Are movie just opened last weekend, I think I'll take this opportunity to voice my interest in this cool-looking title. According to the awesomely-designed back cover, it's an "all-ages novel" that's loosely based both on Sendak's original Where the Wild Things Are as well as the Spike Jonze movie version. 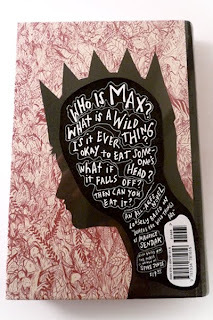 I'll let the book speak for itself, because this quote is what caught my interest: "Who is Max? What is a Wild Thing? Is it ever okay to eat someone's head? What if it falls off? Then can you eat it?" I can already tell that this Max is the kind of kid I want to hang with. That's it for this week--see you soon!